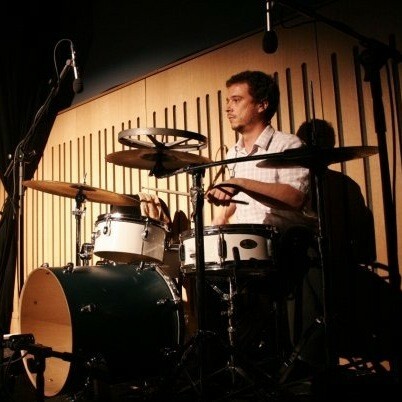 Javier Carmona is a drummer and percussionist that is very active in the European and English free improvisation scenes. He has performed with musicians such as John Tchicai, Evan Parker, Carlos Zingaro and John Russell, among others. He is member of several formations including the London Improvisers Orchestra (CDs published by Emanem Records), FOCO Orchestra, BIB Orchestra, Catatumbo (with Ingrid Laubrock and Olie Brice), a duo with Mark Hanslip (CD published by Babel Records), Alexander Hawkins Ensemble (CDs published by FMR and Babel), Roland Ramanan Tentet (CD published by Leo Records), Perro-chimp (duo with Federico Reuben), Rachel Musson’s Skein (CD published by FIRE Records) and Vole (with Roland Ramanan and Roberto Sassi). Javier organizes the annual International Workshop/Festival of Free Improvisation of Malaga and has also led student workshops about free improvisation in Newport University (with Kamil Korolczuk), Westminster University (with Sakoto Fukuda) and Huddersfield University (with Ingrid Laubrock and Olie Brice). He is co-founder alongside graphic designer and electronics player Kamil Korolczuk of Oso Records, a netlabel of free downloadable music focused on releasing various types of experimental music. Javier also collaborates with dancers Rosa Aledo and Saija Lehtola in Kicking Louise & Co., a dance company that has presented work in France, Cyprus, Spain and England.